Violent pulsating, throbbing mostly in the frontal region or right side. Intolerance of least jar, stooping, light. Headache comes suddenly, lasts an indefinite time and disappears suddenly. 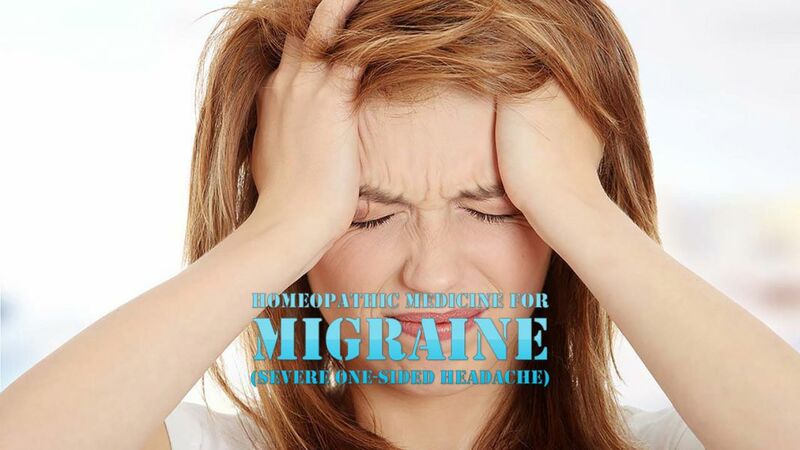 Headache worse afternoon or evening, before or during menses. Better lying in the dark, pressure, binding the head tightly. Migraine in women who menstruate freely. Pains are more right sided. Pain begins in occiput, comes up over the head and settle over eyes, especially right eye. Headache with nausea and vomiting (of bile, food) and chilliness. Better on lying in dark, sleep, passing of copious urine, open air. Attack begins with a blur before eye of the affected side. The pains are mostly located over the eyes, usually one side at a time, mostly the right. Shooting pain in temple, especially right. Sour, watery vomiting at the height of the attack. Headache worse toward evening, cold air, violent motion, coughing. Pain in the right temple and right side of the face. Pain appears and disappears suddenly. Pain starts in the morning, is worst at mid-day, gets better in the evening. Pain worse from mental exertion, dancing, open air. Better from binding the head tightly, pressure. Pressing headache in the right half of the forehead, involving the right eye, as if a ball would be pressed out. Pain in the right side of occiput. Sensation as if a nail were driven out through the side of the head, relieved by lying on it. Headache which increase gradually and suddenly abates. Worse from cold, smoking, smelling tobacco smoke, noise, light, stooping. Better by profuse colorless urine. Boring, tearing, stitching pains in forehead, temples, vertex or occiput, especially left side. Pain settles over left eye. Pain worse by motion, noise, light, stooping, jar. Sepia is beneficial in many forms of headache. Headache with nausea, aversion to all foods, with vertigo. Migraine with pain over one eye of a throbbing character. Headache beginning in the morning and last till noon and evening. Headache worse from least motion-even turning eyes, stooping, going up stairs, lying on back, indoors, fasting, before or during menses. Better from a good sleep, violent motion as walking fast, rest, tight bandage or application of heat (though it is worse in warm room). Pain starts in occiput or neck and spreads over the whole head and settles over the whole head and settles down in forehead or eyes, especially left eye. Vision blurred before headache, as the headache begins the blurriness disappears. Headache is worse by the heat of the sun, mental exertion, smoking, lying with head low. Pain in left orbit, with nausea and vertigo. Pain worse on eating, drinking and walking. Pain in forehead and left side of head, with nausea and vomiting or diarrhea, especially towards evening. Stitches in left temple with nausea, vertigo, pale face and sunken eyes. Worse at night and at rest. Better when moving. Frontal headache over one eye. Shooting at interval in right temple. Nausea, bitter-sour glairy vomiting. Sight returns with increasing headache. Pain especially over left eye. Neuralgic pain in left side of head. Pain worse from noise and talking. Better from rest and cold water. Attack begins in the morning, worse at 10-11 a.m., last till 3 p.m. or evening. Pain as if head would burst or as if beating from little hammer. Headache starts with blindness, zigzag vision. Nausea and vomiting of transparent phlegm or water. Better from perspiration, lying with head high, pressure, moving about in the open air. Pain over left eye, with black spots which dance before eyes. Temporary dim vision before and during headache, with vomiting. Pulsating, boring, pressing pain in one or another temple. Headache worse fasting, heat, stooping, morning, when excited, music, walking fast, lying down, warm room. Better sleep, cold, open air, cold washing. Bursting, pulsating, throbbing, boring, stitching pain on one side of head. Vision dims during headache. Nausea and vomiting during headache. Headache worse heat, sun, exertion, mental strain. Better by slowly walking in open air, cold, pressure. Neuralgic headache every morning over one or the other eye, mostly left, gradually spreading over whole head, worse during rest. Better from motion, vomiting of bile. Throbbing over left eye and across forehead. Very severe headache with nausea and vomiting, like sea-sickness and with shaking chills. Throbbing frontal headache or behind eyes, extending into occiput. Headache worse jarring, least motion of the head, when beginning to move or after stool, heat of the sun, warm drinks.